The Arkansas River is a major tributary of the Mississippi River. The Arkansas generally flows to the east and southeast and traverses the United States states of Colorado, Kansas, Oklahoma, and Arkansas. At 1,469 miles (2,364 km), the Arkansas is the sixth longest river in the United States, the second-longest tributary in the Mississippi-Missouri system, and the 45th longest river in the world. 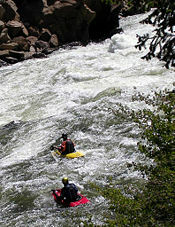 The river's origin is in the Rocky Mountains in Lake County, Colorado, near the town of Leadville. It enters the Mississippi at Napoleon, Arkansas 40 miles (64 km) northeast of Arkansas City, Arkansas. Principal cities along its route are Pueblo, Colorado; Wichita, Kansas; Tulsa, Oklahoma; and Fort Smith and Little Rock, Arkansas. The Arkansas River drainage basin covers 161,000 square miles (417,000 square km), and has a total fall of 11,400 feet (3,500 m). In volume, the river is smaller than both the Missouri and Ohio Rivers, with an average discharge of at its mouth of 41,000 ft³/s (1155 m³/s). Historically, the Arkansas River has played an important role in westward expansion. Native Americans hunted along its length, early explorers followed it westward, and from 1820 to 1846, it served as the boundary between the United States and Mexico. It continues to play an important role in the central states, feeding that region's important farmlands. The Arkansas River has three distinct sections in its long path through the central United States. 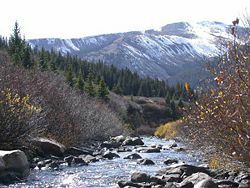 At its headwaters in the Sawatch Range of the Rocky Mountains near the town of Leadville Colorado, the Arkansas runs as a steep mountain torrent through the Rockies in its narrow valley, dropping 4,600 feet (1.4 km) in 120 miles (193 km). This section (including The Numbers, Brown's Canyon, and the Royal Gorge) sees extensive whitewater rafting in the spring and summer. At Cañon City, Colorado, the Arkansas River valley widens and flattens markedly. Just west of Pueblo, Colorado, the river enters the Great Plains. Through the rest of Colorado, through Kansas, and through northern Oklahoma to Tulsa, it is a typical Great Plains riverway, with wide shallow banks subject to seasonal flooding. 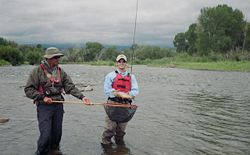 Tributaries include the Canadian River and the Cimarron River, both flowing from northeastern New Mexico, and the Salt Fork Arkansas River. Below Tulsa, and continuing to its mouth, the river is navigable by barges and large river craft thanks to a series of dams that turn it into reservoirs. Above Tulsa, it is navigable only by small craft such as rafts, canoes, and kayaks. Water flow in the Arkansas River (as measured in central Kansas) has dropped from approximately 248 cubic feet per second (7 m³/s) average from 1944-1963 to 53 cubic feet per second (1.5 m³/s) average from 1984-2003, largely because of the pumping of groundwater for irrigation in eastern Colorado and western Kansas. Important cities along the Arkansas include Pueblo, Colorado; Wichita, Kansas; Tulsa, Oklahoma; Fort Smith and Little Rock, Arkansas. 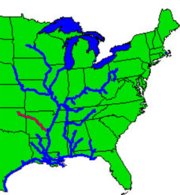 Inland waterway system with McClellan-Kerr Navigational Channel shown in red. The McClellan-Kerr Arkansas River Navigation System is part of the inland waterway system originating at the Tulsa Port of Catoosa and running southeast through Oklahoma and Arkansas to the Mississippi River. Though it primarily follows the Arkansas River, it also follows portions of the Verdigris River in Oklahoma and the White River in Arkansas. It includes the Arkansas Post Canal, a short canal named for nearby Arkansas Post National Memorial, connecting the Arkansas and White Rivers. Through Oklahoma and Arkansas, dams artificially deepen and widen this modest sized river to build it into a commercially navigable body of water. Along the section of the Arkansas River that carries the McClellan-Kerr channel, the river sustains commercial barge traffic and offers passenger and recreational use, and is considered by some, a series of reservoirs. The Arkansas River is quite shallow through Arkansas and Oklahoma, and was naturally incapable of supporting river traffic though most of the year. To allow for navigation, construction was begun in 1971 on a system of channels and locks to connect the many reservoirs along the length of the Arkansas River. The first section, running to Little Rock, Arkansas, opened in 1968. The first barge to reach the Port of Catoosa arrived in early 1971. Each lock measures 110 feet (34 m) wide and 600 feet (180 m) long, the standard size for much of the Mississippi River waterway. Standard jumbo barges, measuring 35 by 195 feet (59 m), are grouped 3 wide by 3 long, with a tug at center rear, to form a barge packet which can be fit into a lock. Larger barge packets must be broken down and passed through the lock in sections, and rejoined on the opposite side. Many nations of Native Americans lived near or along the Arkansas River in its 1,450 mile (2334 km) stretch, but the first Europeans to see the river were members of the Coronado expedition on June 29, 1541 near the site of Dodge City, Kansas. Also in the 1540s Hernando de Soto discovered the junction of the Arkansas with the Mississippi. The name "Arkansas" was first applied by Father Jacques Marquette, who called the river Akansa in his journal of 1673. In 1806 the American explorer Zebulon Pike traveled through the river's upper reaches. From 1819 the Adams-Onís Treaty set the Arkansas as part of the frontier between the United States and Spanish Mexico, which it remained until the annexation of Texas and the Mexican-American War in 1846. 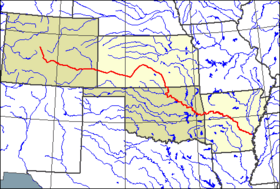 Later, the Santa Fe Trail followed the Arkansas through much of Kansas except for the Cimarron Cutoff from Cimarron, Kansas, to Cimarron, New Mexico, via Cimarron County, Oklahoma along the Cimarron River. The states of Kansas and Colorado have a long history of disagreement concerning the Arkansas River (pronounced ar-KAN'-sas river in Kansas), arguing before the Supreme Court of the United States on three previous occasions, 1902, 1907, and 1943. After the 1943 action, the states developed the Arkansas River Compact, which was intended to apportion the Arkansas River between the two states. In 1985, Kansas alleged that Colorado had violated the Compact and sought legal recourse before the Supreme Court. The Court appointed a Special Master to investigate the allegations and submit recommendations to the Court. In 1994, the Special Master issued his first report, which recommended that the Court find Colorado in violation of the Compact in certain respects. Since then, the Master has issued three more reports and the states have filed various objections, most of which the Court has dismissed. Kansas has filed six exceptions to the reports recommendations, and the United States has intervened to ask the Court to overrule two of them. ↑ J.C. Kammerer. Largest Rivers in the United States U.S. Geological Survey. Retrieved September 22, 2008. Arkansas River Coalition. Arkansas River Retrieved September 22, 2008. EarthTrends. Full Scale Map Retrieved September 22, 2008. Oklahoma. 2007. McClellan-Kerr Arkansas River Navigation System 2007 inland waterway fact sheet. Tulsa: ODOT Waterways Branch. This page was last modified on 14 April 2016, at 15:08.